My card today features the new Cooler with You Card Kit along with a few previously-released faves. :) The image was stamped and colored with Prismacolor Pencils. I layered the drifts that come in the kit over snowfall and framed it all with a Single Stitch Line Rectangle Frame. I used the awesome new plaid patterned paper on the card base. Be sure to head back over to the MFT Blog to see what the rest of the team has come up with using the Cooler with You Card Kit! Love your card! The snowmen in this set are wonderful! I've already placed my order! Love the pop of colors against the white background. This is very cute! I love snowmen, and this little guy is especially cute!! So cute and such a fun kit! Love these snowmen! Thanks for the inspiration! A great clean and simple card. Love the patterns that you used as part of the background! Great card! I love the background! Such a sweet card. Love the patterned paper. Don't know if I could leave a card with so much white space...I always want to fill them up...LOL. Oh wow--I love the dotted background--great card! I love the pattern paper and the green frame you used to set the winter scene. So cute! Beautiful card!! I love White space on the front panel and patterned paper on the background!! Thanks for sharing! I also love the white on white. Great winter card! 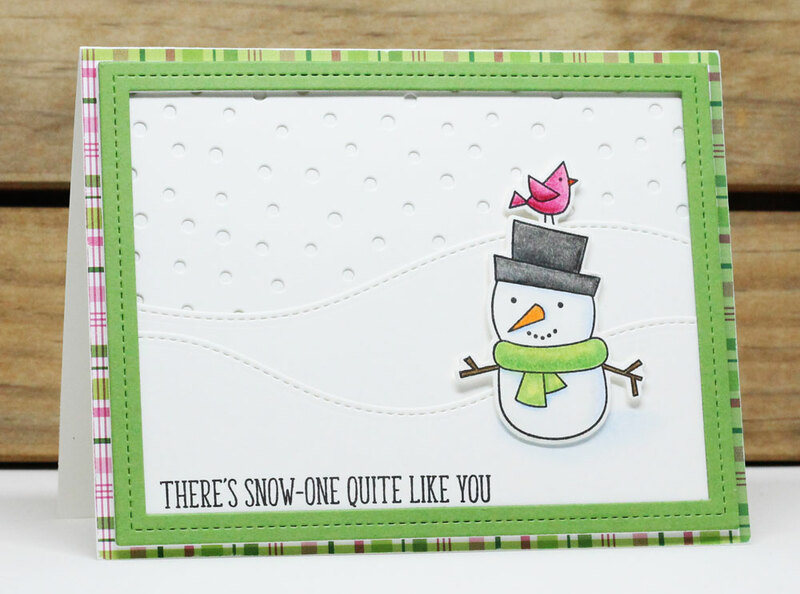 I love the snowy background and the cute snowman and the plaid card base is perfect! Thanks so much for sharing! Love all the white with the pop of color on the frame and the snowman. Beautiful card. Jody your card is so adorable!! I love that you kept the colors simple! It lets your sweet snowman shine through!! Cute! I love your background with the snow flakes and snow drifts. So sweet! It makes me smile!! Adorable card! Love the background & the snowman! Very cute! Love the adorable snowman! The frame really highlights the other parts of the card. Cute scene and I like the sentiment. A fun card and fantastic kit. Love the pattern paper base! Love the textures and details! The snowman is adorable! I never would have thought to use patterned paper behind the green frame. Great idea. I want to try that. Well done. adorable snowman. Your card is gorgeous. Jody, Great Card! I love the White on White on White! The color contrast is fabulous. The plaid background and the green frame is a WOW!